Catherine Susan Hart passed away peacefully on March 18, 2018. She was born on May 9th, 1972 in Sun Valley Idaho to Daniel Joseph Hart and Barbara Belcher Robb Hart. Catherine came to the Peninsula after a vacation from college, and because her parents moved to Port Angeles. Catherine received her Bachelor of Arts degree from University of Puget Sound Tacoma in 1990. Catherine was an artist (watercolor, oils and acrylic), dancer (ballet, modern, and Brazilian), a graphic designer, executive assistant and writer. She was unable to work the last few years due to health issues. Catherine married in a lovely mountain wedding in Ketchum, Idaho, they divorced a year and a half later in 1992. Normally Catherine was shy but with an outgoing personality, she was very excited and pleased about her pregnancy and looking forward to having "Morgan Jupiter" a name she and her fiance had picked out. She loved the mountains, the ocean beaches, loved to swim, ski, read, dance and listen to music. She was compassionate, caring and a loyal friend, she loved nature and wild life, her interests ranged widely: art, philosophy, languages (French, Spanish, Chinese, Nepalese, Portuguese), cultures worldwide (Pacific Islands and Saipan, Indonesia, Japanese, Korean, French), interested in fashion, science, creative arts, yoga and pilates and was a personal trainer. 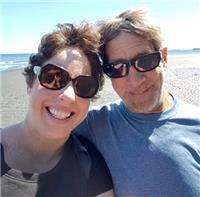 Catherine leaves behind her beloved fiance; Ron Hankins of Port Angeles. Catherine was preceded in death by her maternal and paternal grandparents, and her beloved infant daughter (stillborn) Morgan Jupiter Hart, many aunts, uncles and cousins. Catherine was laid to rest at the Mount Angeles Cemetery. In loving memory of Catherine "Cat" Hart, my beautiful fiancé, soul mate and mother of our unborn daughter, Morgan Jupiter Hankins, who both passed away unexpectedly on March 18, 2018 due to complications of our pregnancy. Cat was born May 9, 1972 in Idaho to Dan & Barb Hart. Cat was my true love; her smile exuded happiness and joy. She was passionate about yoga, art, dancing, writing and championing those in need. She was deeply cherished and will be truly missed by me, Ron Hankins and many others. Cat often stated she was the happiest she had ever been in her life as we lived, loved and planned for our future together with our daughter Morgan. Motherhood is challenging; and you, Cat gave the ultimate sacrifice. It gives me great comfort to know that you and Morgan Jupiter are together forever. I will always love and miss you.